Mini Wars by Arphix is a side scrolling shooter for the iPhone and iPod touch that really gives you the feeling of a competitive multiplayer game, even though it’s not really multiplayer. 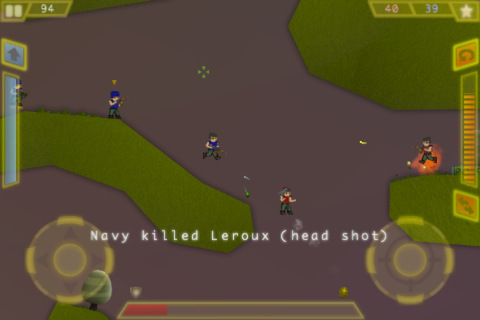 Like shooters for other consoles, Mini Wars has three game types; team death match, free for all, and capture the flag. For those who are not in the fan base of shooters let me explain the three in the simplest way I can. Team death match is basically teams vs. teams. Whoever gets the most points, or in this situation; kills, wins. Free for all is just an all out pew pew fest. Shoot whoever gets in your way, and try not to die and again, most kills wins. Capture the flag however isn’t a game of most kills. You work as a team to take control of the opponent’s flag at their spawn point, and your objective is to bring it back to your flag. At the end of the given time whoever has the most point’s wins. Graphics wise, Mini Wars won’t be the most attractive game out there, but it’s definitely not terrible to look at. I mean, nothing really stands out visually; just a bunch of chibi sized units. It reminds me of a free MMO awhile back named Gunster which was loads of fun but even simpler. The controls in Mini Wars are a bit sluggish and really hard to get used to. Since the directional aim and shooting is the same button, it’s really hard to get a hang of. The CPU however doesn’t see this as an issue. Fighting against the AI would probably be more difficult than against human players. Weapons wise, Mini Wars is awesome. It’s a small game so don’t expect as many as counter strike, or black ops. Nothing beats running around with the chainsaw. The chainsaw is my way around the hard aiming controls. Some weapons feel more broken than others. The $1.99 tag is a good price for this app. It is a fun game, simple, challenging, and a great app to kill some free time. There is also a lite version. So for all of you who are into side scrolling shooters, look for Mini Wars in the App Store. Sample the free version of Mini Wars on your iPhone. 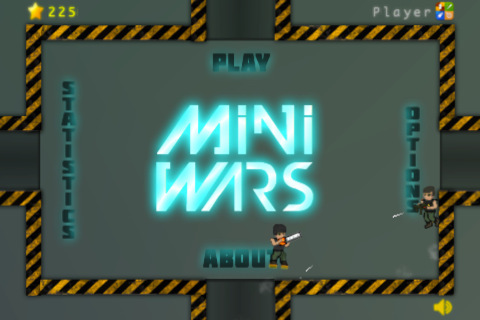 AppSafari review of Mini Wars was written by Vincent Tam on April 13th, 2011 and categorized under Action, App Store, Games, Scrolling Shooter. Page viewed 5029 times, 1 so far today. Need help on using these apps? Please read the Help Page.